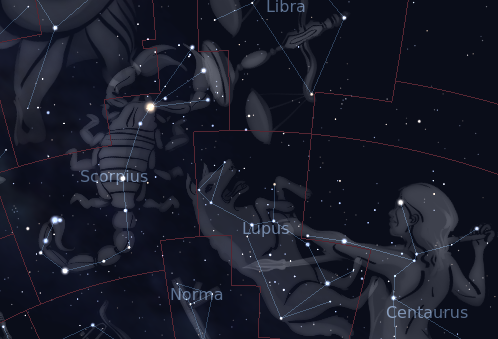 The constellation Lupus. Roll mouse over to see labels. Lupus is a southern constellation which appears highest in the midnight sky in May. Its name is Latin for ‘wolf’, and the creature depicted here is usually depicted impaled on a long pole held by Centaurus the centaur, perhaps about to be sacrificed on Ara the altar. The outline of the wolf's body is traced out by second and third magnitude stars. 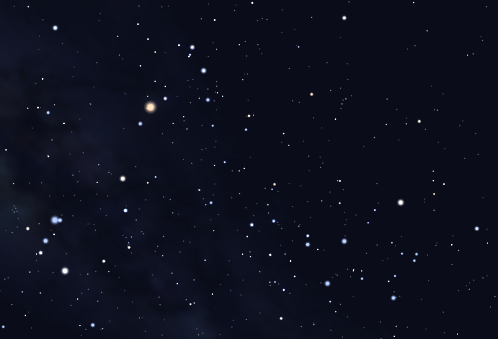 This sky area also offers several bright open clusters and globular clusters since it lies close to the plane of the Milky Way. There appear to be few Greek myths associated with Lupus, perhaps because it is a much older Babylonian constellation which the Greeks adopted without change. The following constellations neighbor Lupus: Centaurus, Circinus, Hydra, Libra, Norma, Scorpius.